If you follow both Japanese live-action cinema and the anime and manga scene you might be aware that some pretty major live-action adaptations of manga and anime have been hitting Japanese cinemas recently. Ryuhei Kitamura (director of Versus) released his adaptation of the classic Lupin III in August 2014. Later the same year 1990's manga Parasyte's long overdue anime adaptation was joined by the first part of a two-part live version from Toho Studios. Then there's summer 2015's big-screen version of colossal hit Attack On Titan- which is coming to the US later this year. Yet this is nothing new, as Japan has been adapting manga into live-action film and television since before anime as we know it had even come into being. And it all started on the small screen. Osamu Tezuka's Astro Boy (Testuwan Atom) is often credited as the anime that started it all. But what you might not know that the Mighty Atom was adapted into a live-action series years before the animated incarnation hit screens. The 1959 series may have been largely overshadowed by the 1963 anime, but it was a big enough hit to run for 65 episodes. This was only the beginning though, and it was soon joined by other hit manga of the time like Tetsujin 28 (aka Gigantor). When anime came along it became clear that the animated medium allowed for more faithful adaptations of Manga for the screen. The special effects and design budgets of Japanese network TV of the time couldn't compete with animation when it came to recreating manga's more fantastic elements. Japanese TV producers have instead found much greater success adapting manga with much more down to earth subjects. Romances, comedies and high-school dramas so beloved of the audience of shojo manga have found great success on Japanese TV. Series such as Paradise Kiss, Lovely Complex and Nodame Cantabile have found great success. The more realistic content of series such as these, without obvious fantasy elements make them arguably more suited to live action than animation. With their casts of pretty young things and universal human themes and drama they also appeal to a more general audience, far beyond the usual manga fan crowd. Similarly, other genres such as sports series (such as Aim For The Ace) or Crime dramas (MPD Psycho) have traditionally adapted well into live-action. Yakuza drama has also been a genre that has traditionally done well. Of course, this is not to suggest that there have been no more attempts to adapt the more fantastic material at all. As technology has improved (and become more affordable) we've seen more ambitious efforts like Moyashimon and the Ranma ½ TV special. 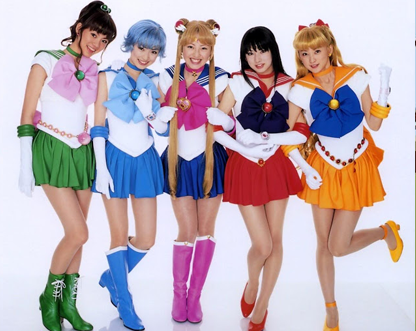 Even Sailor Moon got its own live-action series at one point. Japanese TV continues to mine comic adaptations to this day, with Death Note the latest hit series to hit the small screen. The series follows a successful run on the big screen spawning two movies and a prequel featuring fan-favourite character L.
Japan is not the only part of Asia with a booming TV industry though, and some of those neighbours have also turned to manga for inspiration. 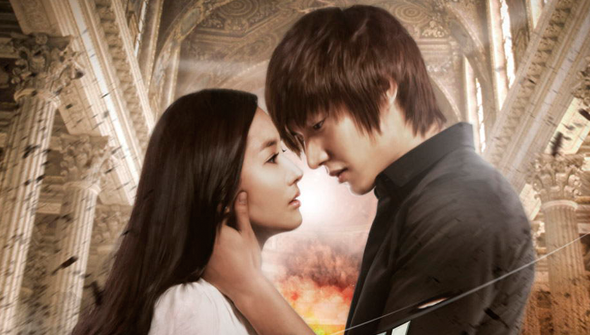 Korean TV drama also often concentrates on pretty people in love, so has had considerable success with manga-based series such as Boys Over Flowers. Outside the romance genre, 80's classic City Hunter made a very well-received transition to live-action Korean TV. Taiwan has followed suit, with not only it's own adaptation of Boys Over Flowers, but versions of series including Hayate The Combat Butler, Hana Kimi and Skip Beat. Next time, we look at Manga's journey to the big screen!